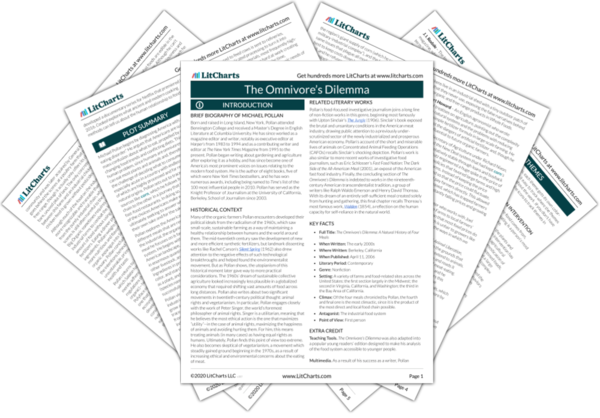 Instant downloads of all 945 LitChart PDFs (including The Omnivore’s Dilemma). 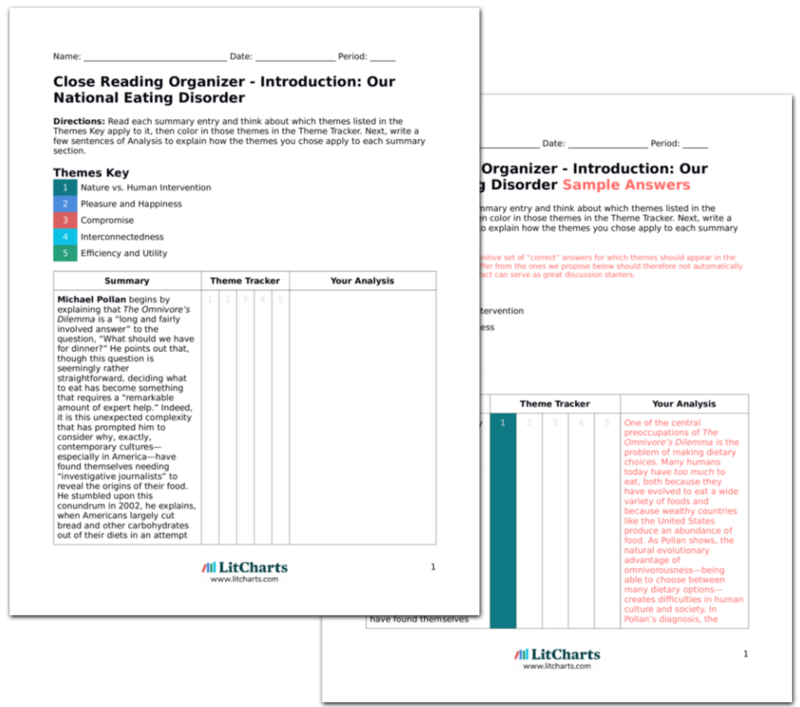 LitCharts assigns a color and icon to each theme in The Omnivore’s Dilemma, which you can use to track the themes throughout the work. Pollan decides to visit a McDonald’s with his son Isaac and wife Judith, in order to see the final stage of the line of production he’s been tracking for the first part of The Omnivore’s Dilemma. He notes that the menu engages in clever marketing strategies that target different demographics in the family. Pollan orders a cheeseburger; Judith orders a Cobb salad; Isaac orders chicken nuggets. The family eats their meal in the car, which, as Pollan notes, is now fairly common: 19 percent of American meals are eaten in the car. Besides, “corn was the theme of this meal,” and the Pollan family car is also consuming ethanol. Fast food companies have become very effective at marketing, which is a necessary tool in getting consumers to eat more and thus boosting their profits. These strategies are mainly rhetorical, however, since even Judith’s salad in fact contains a higher number of calories than is desirable for humans to consume in a single day. Here, again, what is good for fast food companies is not necessarily what is good for human health. In Pollan’s account, fast food gives pleasure to the eater in large part because of its nostalgic qualities. People enjoy eating fast food because it reminds them, for instance, of happy times in their childhoods. But Pollan suggests that this is more an illusion than a reality, since the chicken McNugget in fact has little relation to “real” chicken found in nature. This is what he means when he asserts that the McNugget is more an abstraction than a real food. Observing that the relationship between his cheeseburger and beef also seemed largely “notional,” Pollan suggests that the appeal of fast food is that it allows people to forget they’re eating animals at all. It also obscures the process of food production so that people don’t know just how much processed corn they’re eating. With the help of a scientist, he realizes that most of his family’s McDonald’s meal is corn, from the soda (100%) to the chicken nuggets (56%). What looks like a meal of “impressive variety” is in reality made from a single ingredient. Processed food is so appealing, Pollan argues, because it thoroughly obscures the food production process and the interconnectedness of the world’s food chain. A McNugget doesn’t seem to come from anywhere at all, thus allowing the eater to forget that they are consuming an animal that has lived and died somewhere to produce this meat. For Pollan, the overconsumption of corn in the modern industrial food system is clearly a bad thing—for the environment, for farmers, for the health of Americans, and for global inequality. It is an efficient system for business, but an inefficient system for everyone else. Perhaps most surprisingly, he is even quite skeptical about the pleasures of fast food. Conventional wisdom would suggest that people eat this food because it tastes good, but he argues that fast food is more an idea than anything else. It gives superficial pleasures, but those are ultimately fleeting. 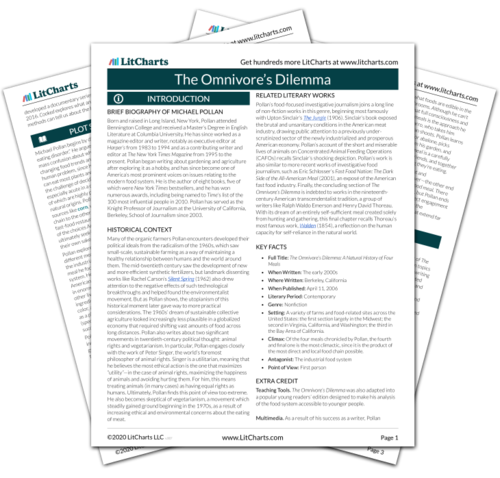 Get the entire The Omnivore’s Dilemma LitChart as a printable PDF. Houghton, Eve. "The Omnivore’s Dilemma Chapter 7: The Meal: Fast Food." LitCharts. LitCharts LLC, 28 Jun 2018. Web. 11 Dec 2018. Houghton, Eve. "The Omnivore’s Dilemma Chapter 7: The Meal: Fast Food." LitCharts LLC, June 28, 2018. Retrieved December 11, 2018. https://www.litcharts.com/lit/the-omnivore-s-dilemma/chapter-7-the-meal-fast-food.